To follow up on my post yesterday on the so-called "stabilization wedges" of Rob Socolow and Steve Pacala, I thought that it would be useful to revisit the substantive reasons why it is that the wedges analysis has beem so misleading in the climate debate. I thought it also would be useful to add a perspective on why it is that some parts of the environmental community go on the attack when it comes to those who have criticized the wedges. Pacala and Socolow (8) analyzed a scenario that envisioned stabilizing atmospheric concentrations of CO2 at 500 ppm within 50 years. They found that reaching that goal required the deployment of seven existing or nearly existing groups of technologies, such as more fuel-efficient vehicles, to remove seven “wedges” of predicted future emissions (the wedge image coming from the shape created by graphing each increment of avoided future emissions). Those seven wedges, each of which represents 25 gigatons of avoided carbon emissions by 2054, are cited by some as sufficient to “solve” climate change for 50 years (9). Unfortunately, the original wedges approach greatly underestimates needed reductions. 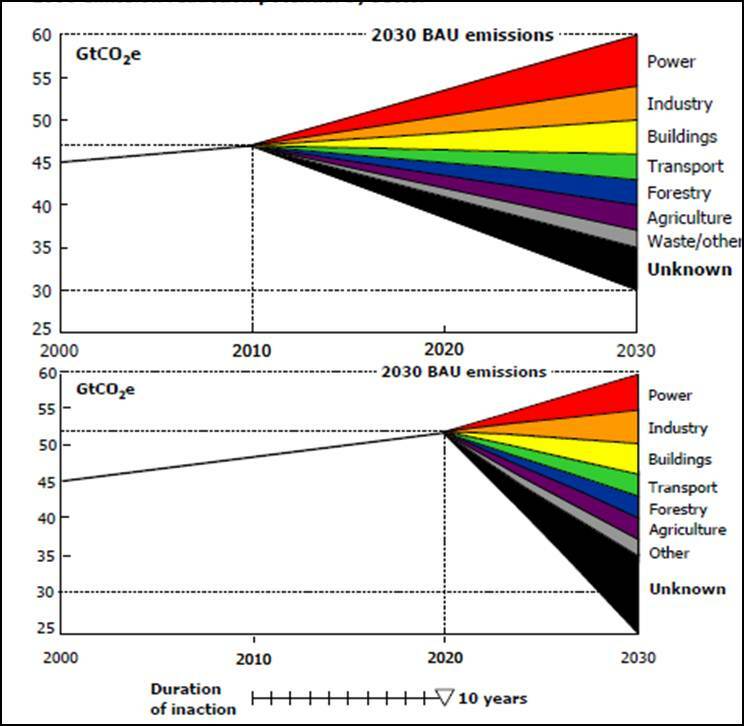 In part, that is because Pacala and Socolow built their scenario on a business as usual (BAU) emissions baseline based on assumptions that do not appear to be coming true. For instance, the scenario assumes that a shift in the mix of fossil fuels will reduce the amount of carbon released per unit of energy. This carbon-to-energy ratio did decline during prior shifts from coal to oil, and then from oil to natural gas. Now, however, the ratio is increasing as natural gas and oil approach peak production, coal production rises, and new coal-fi red power plants are built in China, India, and the United States (10). The enormous challenge of making the transition to carbon-neutral power sources becomes even clearer when emissions-reduction scenarios are based on arguably more realistic baselines, such as the Intergovernmental Panel on Climate Change’s “frozen technology” scenario ( 11, 12). 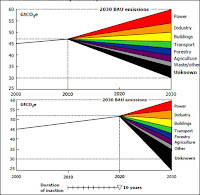 Capturing all alternate energy technologies, including those assumed within this BAU scenario, means that a total of ~18 of Pacala and Socolow’s wedges would be needed to curb emissions (13) (see the figure). And to keep future warming below 2°C . . . an additional 7 wedges of emissions reductions would be needed— for a total of 25 wedges (see the figure). The total is even more than 25 wedges if you want to avoid using the oceans as a store of carbon dioxide or reduce emissions below 2010 levels.. The numbers that Hoffert presents in his perspective are the same as those that I present in The Climate Fix, under a similar analysis.
. . . [one wedge] by 2050 would require adding globally, an average of 17 [nuclear] plants each year, while building an average of 9 plants a year to replace those that will be retired, for a total of one nuclear plant every two weeks for four decades — plus 10 Yucca Mountains to store the waste. 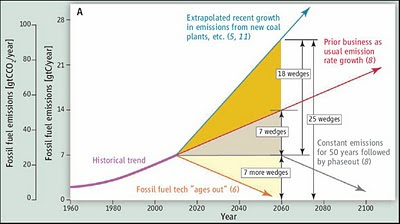 Romm thinks we need about 14 "wedges" of effort to stabilize carbon dioxide concentrations at 450 ppm, and if one wedge implies a need for 26 nuclear plants per year, then 14 wedges implies 26 * 14 = 364 plants per year, or the equivalent effort of one nuclear power plant per day of carbon-free energy. If you accept Hoffert's arguments, then using Romm's conversion you'd need 26 * 25 = 650 nuclear plants worth of carbon free energy, or closer to 2 per day. This task -- at either Hoffert's or Romm's level of effort -- is clearly impossible with today's technology. One might think that the modern environmental movement is adept enough at simple math to accept this message and thus proceed to advocate policies consistent with our lack of technological capabilities, such as calling for a much greater commitment to innovation. While some have, of course, the loudest, most well funded and arguably most influential parts of the movement have strenuously resisted the notion that we do not have the technology needed to rapidly decarbonize our economy, preferring to hold on to the myth that -- in the words of the original "wedges" paper -- "Humanity can solve the carbon and climate problem in the first half of this century simply by scaling up what we already know how to do." I discuss this myth at length in Chapter 2 of The Climate Fix. What explains the environmental community's strict adherence to bad math and flawed policy? In an overlooked part of Matt Nisbet's recent report titled Climate Shift (see his Chapter 2), Nisbet explained that the American environmental community decided to unite under a common set of strategies that were expressed in a 2007 report called Design to Win (PDF, I earlier critiqued the report as "Doomed to Fail"). This common approach would allow efforts to be coordinated and reinforcing. Central to the approach was the so-called wedges and the misleading notion that we have all the technology that we need, meaning that the challenge was one of shaping political will and public opinion. On the scientific advisory committee of the DTW report was Robert Socolow. The good news is that we already have the technology and know-how to achieve these carbon reductions – often at a cost-savings. Design to Win’s synthesis of the latest scientific and economic analyses, including the Stern Review, Vattenfall climate abatement map prepared by McKinsey & Company, and reports by the Intergovernmental Panel on Climate Change, concluded that about 80 percent of the needed mitigation – 25 gigatons of carbon – can be achieved with existing technologies (Figure 4). The key lies in rapidly deploying such technologies in our power plants, buildings, factories and vehicles, and improving land management practices. The focus on deployment, often to derision if not the exclusion of the need for innovation, is still central to environmental messaging, even as the math of emissions reductions would seem obvious and the policy centerpiece of DTW -- cap-and-trade -- has failed comprehensively. What explains the adherence to bad ideas in the form of bad policy? I'm not entirely sure but it just so happens that groups such as the Center for American Process have been funded under the Design to Win strategy to spread its message. Apparently that includes a healthy dose of efforts to delegitmize alternative points of view and to poison what otherwise might be characterized as a healthy public debate over policy options. To the extent that these efforts succeed, climate policy and the broader environmental movement suffer.